A few snapshots from my July, starting from above left: flip flops, a summer staple, top right: frozen pink punch, who wouldn’t want that on a hot day? Bottom left: an epic failure I made for Independence Day – there may be a post about it coming soon, and bottom right: taking in a ballgame is always a highlight! 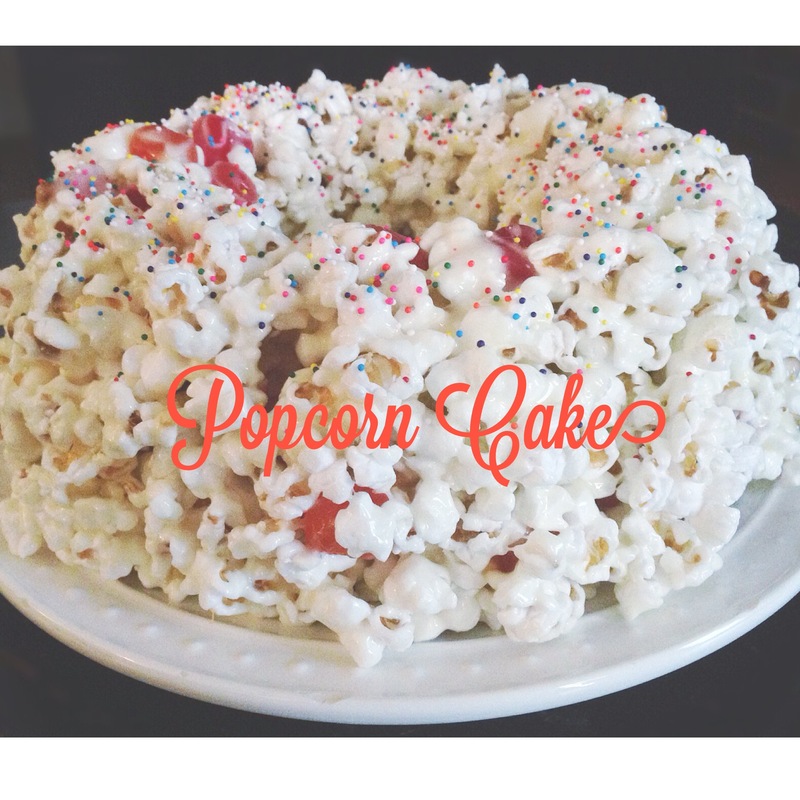 To continue with my series of easy and inexpensive activities for kids, lets make a popcorn cake, shall we? This is a cake I think just about any child (and adult!) would love; popcorn, gumdrops, peanuts, and melted marshmallows; it sounds like a creation fresh out of Willy Wonka’s chocolate factory. With minimal effort, you can have this cake ready to eat in no time – which is good, unless you happen to have/know a child with an unusual amount of patience! Oh by the way, a big bonus is no use of the oven needed! With a mixture of popcorn, gumdrops, and melted marshmallows, this is a sure pleaser! 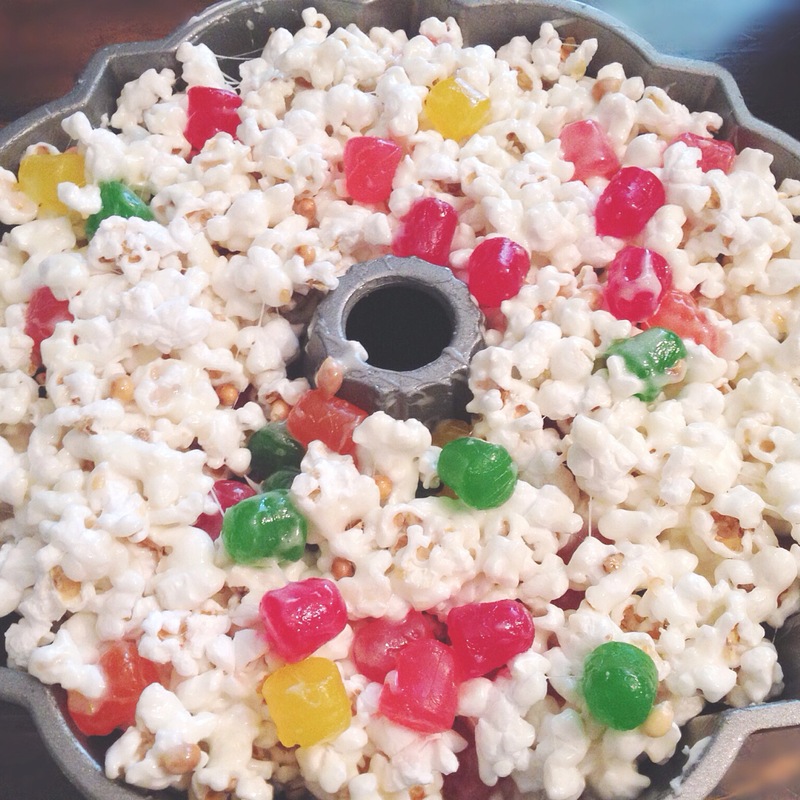 In a large bowl, combine popcorn, gumdrops and peanuts (you may have to use your hands). In a large saucepan over medium high heat, melt butter, oil and marshmallows until marshmallows are thoroughly melted and mixture is smooth. Pour marshmallow mixture over popcorn/candy mixture. Stir (again, you may have to use your hands some) until combined. Place in a generously (and I do mean GENEROUSLY) buttered tube/bundt pan. Once the mixture has cooled, turn out onto a serving plate. Must be prepared the same day it is served.